Enjoy an incredible interactive experience on this Dolphin Swim Adventure Tour along the Pacific Coast of Mexico. 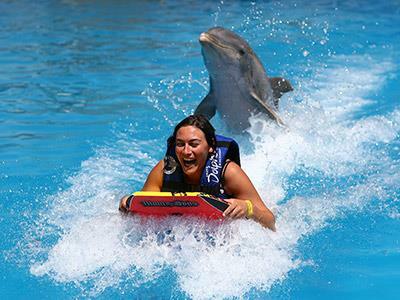 On this tour you can swim and interact with bottlenose dolphins at the Aquaventuras Park dolphinarium in Puerto Vallarta. On this tour you’ll be provided with snorkel equipment to watch the dolphins perform form under the water. You’ll learn all about them, watch them jump, dance and perform, and even kiss and caress them. During this fun-filled dolphinarium tour you’ll be accompanied by trained staff that will teach you basic signals and supervise your time in the water with these intelligent animals. The highlight of this tour is the belly ride and boogie board push. Afterwards you can enjoy all of the facilities at Aquaventuras Park including water slides, swimming pools, and a relaxing lazy river. Take advantage of this unique opportunity to play, touch and swim with dolphins during this incredible tour in Puerto Vallarta. Book your spot and get ready for an unforgettable experience!